Conclusion. Headline increases in youth vaping prevalence demand a nuanced analysis that makes meaningful distinctions between experimental use and regular or daily use, and drills down into the smoking behaviours of the regular users. It is likely that the more intensive vapers are also smokers and will derive benefits from vaping. While a political concern in response to increased teenage vaping prevalence is inevitable, it is important to ensure that reaction is based on facts, effectively addresses risks and benefits of policy changes, and has a strong rationale in public health terms. The overwhelming cause of nicotine or tobacco-related harm is from smoking and policymakers should consider the interactions between smoking and vaping in both adults and adolescents. Excessively risk-averse policies towards vaping may trigger unintended consequences that would harm both adults and adolescents by obstructing migration from smoking to vaping. Policymakers should consider these issues when responding to increases in youth vaping prevalence. I signed on to a letter organised by Dr Lynne Dawkins to Mrs Helma Lodders, Committee Chair, Committee for Health, Welfare and Sports, House of Representatives (Netherlands). The letter was signed by 36 international experts and academics. Letter from Carrie Wade and Clive Bates to The Hon Carrie Lam, GBM, GBS, Chief Executive, Hong Kong. January 2019 United States Response to consultation on Healthy People 2030 objectives. November 2018 United States Letter from Iowa Attorney General Miller to Scott Gottlieb, FDA. Letter to set out issues with youth vaping and to caution against over-reaction. September 2018 Global/WHO Letter to WHO Director-General, Dr Tedros Adhanom Ghebreyesus. In advance of FCTC COP-8, Abrams, Bates, Niaura & Sweanor write to the WHO Director-General to implore the organisation to stop promoting vaping prohibition and excessive regulation. All they are doing is protecting the cigarette trade. We write to oppose an ill-conceived and prohibitionist campaign by health organisations to have e-cigarettes and other low-risk products banned in Hong Kong. David Abrams, Ray Niaura, David Sweanor and I have submitted comments on the draft tobacco and vaping legislation under discussion in South Africa. We argue that the legislation is ‘disproportionate’ towards tobacco harm reduction and should be amended to be ‘risk-proportionate’. Our full 20-page submission in PDF form is here. A rapid response input to a meeting on 19 June 2018. See this June 2018 submission. See also the June 2015 submission. Submission to the consultation on the Commission’s draft first report from David Abrams, Clive Bates, Ray Niaura and David Sweanor > Response to the consultation. We stress a strengthened approach to tobacco control with a strong focus on smoking as the primary cause of the NCD burden. To that end, we recommend the international community adopts a strategy of embedding tobacco harm reduction in tobacco control efforts. We provide an overview of the main issues and relevant science and make four main recommendations for amendments and insertions in the text of the draft. 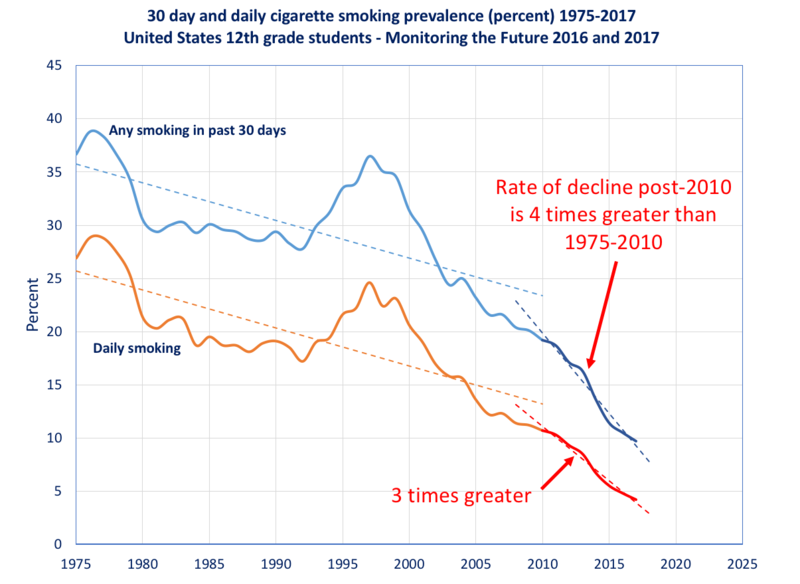 Trends in US teenage and adult smoking – the story in five charts. Updated two-page handout on what is really going on. The UK Department of Health and Social Care published a ridiculous statement on oral tobacco products attempting to justify its defence of the EU ban on snus to the House of Commons Science and Technology Committee inquiry into e-cigarettes. It argues, in effect, that it needs the snus ban to so debase the EU’s ‘proportionality principle’ that this central principle of good policymaking cannot be used to challenge the government’s favoured tobacco control measures such as plain packaging, for which there is little supporting evidence. I responded with an analysis of how its approach violates the EU principles of proportionality, non-discrimination and precaution. See my Submission in response to a letter to the Committee from the Secretary of State regarding oral tobacco. Amicus briefs in support of Nicopure and Right to be Smokefree Coalition challenge to FDA deeming rule for e-cigarettes, now before the US Court of Appeal. Letter and briefing from Iowa Attorney General, me and others on vape flavours and why a more rigorous approach to evaluating harms and benefits is required in the form of ten questions needed to interrogate the issue. Related blog: Regulating e-liquid flavors – is the U.S. regulator more likely to do harm than good and how would it know? 35-page submission on health, regulation and financial aspects of e-cigarettes. See on Parliament web site. See all submissions. 17 experts comment to FDA on the case for allowing Philip Morris International to make reduced exposure, reduced risk and reduced harm claims for its iQOS heat-not-burn product. See applications details on the FDA website and comments at the Regulations.gov docket for this consultation. Letter to the Foundation for a Smoke Free World about money, governance, conflicts and Philip Morris International. We believe the leading direction in tobacco and public health policy is to differentiate tobacco products by risk, including through risk-differentiated taxation. For example in the UK, the excise duties payable on the Philip Morris International iQOS heatsticks are 69% lower than on the same company’s Marlboro cigarettes. Our letter expands on these themes. Reducing nicotine in cigarettes: Challenges and opportunities (PDF) – joint report with Carrie Wade of R Street Institute on the (formidable) challenges of introducing a reduced nicotine rule in the United States, but also a way to use it to advantage. 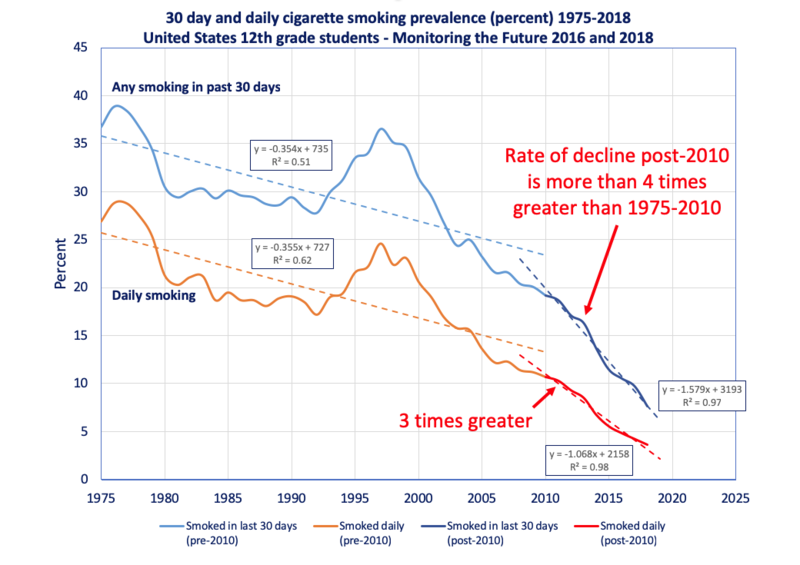 More details plus a 3-minute summary and PowerPoint presentation at the blog: FDA wants to reduce nicotine in cigarettes – what could possibly go wrong (and right)? R Street Institute version: Policy Study 115. Do vapour products reduce or increase smoking? (with Colin Mendelsohn). List of citations and quotes suggesting vaping reduces smoking, and does not increase it. See blog prepared for my trip to Australia for background and context: Is Australia falling behind on tobacco policy? A two-page handout on what is really going on. Review of a controversial Canadian ‘gateway-effect’ paper. The authors confidently claim their study shows: “Vaping doubles risk of smoking cigarettes for teens“. It doesn’t. 4. Fails tests for public health and good regulation. Follow up letter on tobacco tax policy in Israel to Ministry of Health from Clive Bates, Martin Jarvis, Mark Kleiman, Sally Satel, Jeff Stier, David Sweanor. From the covering email: At present we understand the Ministry of Health does not consider there to be an established difference in health risk. Given what is known, we think it should be assumed that the risks from the heated products are significantly lower, at least until some evidence to the contrary emerges – none exists to date. We explain this reasoning in the letter. Full letter: Policy on taxation of tobacco and nicotine products – relative risk of heated tobacco products compared to smoking. This follows a letter of 8 May to the Finance Ministry. A package urging FDA to reform its approach to low-risk tobacco and nicotine products. Eighteen experts write to European Commissioner about snus and the legal action. Letter on tobacco policy in Israel to Minister of Finance and Director of Tax Authority from Clive Bates, Mark Kleiman, David Levy, Sally Satel, Jeff Stier, David Sweanor. From the covering email: To summarise, we hope that Israel will adopt a tobacco tax philosophy that reflects the very different degree of risk associated with different tobacco and nicotine products – notably between those that involve combustion and those that do not. This would provide a fiscal incentive to encourage consumers to switch from high-risk to low-risk products, with a commensurate benefit for public health. Letter to Deputy Minister of Health Czech Republic,Lenka Teska Arnostova, from Clive Bates and Eva Králíková responding to her request for a positive harm reduction agenda, and including the need to reform Tobacco Products Directive asap. In English / Czech language. This is a follow up to our original submission of September 2016. Blog: Australian medicines regulator intends to continue to protect the cigarette trade – we challenge its bizarre reasoning. Counterfactual Blog: Reshaping American tobacco policy: eight proposals for the Trump administration with 2-page briefings on each proposal. Not actually my document, but I want links to it here. My talking points for meetings in Washington DC + what should happen next in the United States. Letter to UK Health Secretary calling for the UK to use legislation for repealing European Communities Act to also repeal bad e-cigarette regulation and to lift snus ban. Letter to the EU group working on EU position for 7th Conference of the Parties (COP-7) making suggestions for good policies that could come from COP. Letter in response to negative comments about vaping and the vaping industry by Mitch Zeller. Calls for a more reasoned debate about nicotine, risk and regulation. With Eli Lehrer, President of R Street. Consultation response on policy options for e-cigarettes – covers age restrictions, advertising use in public places and numerous technical issues. With David Sweanor. Consultation response from 40 experts that makes the case for reclassifying nicotine to allow e-liquids to be sold legally in Australia. A brief of amici curiae in the case of Nicopure et al vs FDA – the brief argues that FDA’s cost-benefit analysis has no material benefits and ignores huge health costs and unintended consequences. With 15 experts. Comparison of the rules for observers between the WHO Framework Convention of Tobacco Control and the UN Framework Convention on Climate Change. Letter to David Cameron calling for proper impact assessment, monitoring of adverse effects, and review of the directive. With New Nicotine Alliance. An e-letter in Tobacco Control criticising Myers’ trivial and largely irrelevant criticisms of FDA when much greater issues demand the attention of both FDA and Congress. Consultation response on options for the new tobacco control plan. Sets likely unintended consequences of EU policy on vapour technologies and calls for the government to be more proactive in reviewing and amending the directive. With New Nicotine Alliance. Letter to Slovenia’s Prime Minister and Minister of Health calling for a pragmatic approach to implementation of the Tobacco Products Directive – especially with regard to internet sales. With Gerry Stimson. Letter to Austria’s Minister of Health calling for a pragmatic approach to implementation of the Tobacco Products Directive – especially with regard to internet sales. With Gerry Stimson. Letter to Austria’s Minister of Health arguing against its plan to widen the EU ban on snus to cover all smokeless tobacco. With Gerry Stimson. Article for Politique Internationale on regulation for harm reduction rather than drug prohibition. Two themes: (1) purpose of policy should be reducing harm; (2) policy itself can be a significant cause of harm. Submission to Australian Senate inquiry into personal choice and community (also referred to as the Nanny State) for its strand on tobacco and e-cigarettes. With David Sweanor, Ron Borland, Lynn Kozlowski. Mrs. Tan Ching Yee, Permanent Secretary (Health) setting out the case against banning e-cigarettes. See blog: Singapore law protects the most dangerous nicotine products, bans the safest – why? My views on the many absurdities of the way the US regulator, the FDA, approaches communication of reduced risk to the consumers. See also a submission done jointly with 17 academics. Relates to snus MRTP application. A disruptive public health technology threatened by excessive regulation. See blog: Canadian Dawn – following a positive report by this committee. Analysis of the false and misleading risk communications about e-cigarettes coming from WHO in the run-up to FCTC COP-6. My critique of the multiple submissions to the FDA by Professor Stanton Glantz and his colleagues aiming to create harmful regulation for e-cigarettes. I put the counter case. May 2014 Global / WHO Letter to WHO Director General Margaret Chan by 53 scientists and experts Letter titled: Reducing the toll of death and disease from tobacco – tobacco harm reduction and the Framework Convention on Tobacco Control (FCTC). Letter makes case for a more balanced approach to tobacco harm reduction. A response and counter response followed.